Rice cultivars bred for fertile soils may not be the best suited to nutrient limited environments. Therefore, rice cultivars suited to sustain productivity in low-fertile soils and their adaptive mechanisms for success need to be identified. Field experiments were conducted in fertile and low-fertile sites for two and five seasons, respectively, using forty four widely grown rice cultivars in Sri Lanka. Growth and tissue nitrogen (N), phosphorus (P) and potassium (K) concentrations were measured. Plant biomass and shoot- N, P and K contents were reduced by 41, 54, 74 and 36% under low soil fertility, respectively, while crop duration was extended by 12 days. Relationships between grain dry weight (DW- g plant−1) of a cultivar, and seed N, P and K concentrations were negative (P < 0.05) at the fertile site, and this was true only for N at the low-fertile site. Seed- P and K concentrations at the low-fertile site reached to minimum and stable concentrations (1.45 and 1.61 mg g−1, respectively). 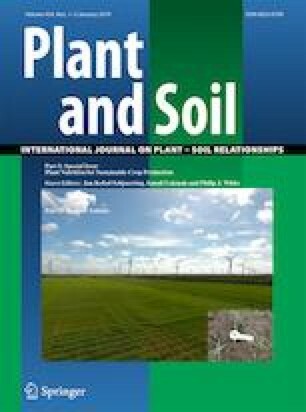 Irrespective of the soil fertility status, grain DW of rice cultivars was positively correlated with shoot N, P and K contents (mg plant−1) and their accumulation rates (mg plant−1 day−1). Moreover, grain DW of a rice cultivar at the low-fertile site could be explained by shoot P content, seed P concentration and P-harvest index through regression (R2 = 0.74, significant at P < 0.05). Cultivars; Bw451, Bg379–2, H4, At362, Ld408, Bg454, Bw400, At353, Bg380, At402, Bw452, Ld365, and Bw453 had higher grain DW than other cultivars at the low-fertile site. Rice cultivars with higher capacity to accumulate N, P and K (mg plant−1 day−1), and longer crop duration ensured higher grain DW while seed P and K concentrations are not good indicators to select promising rice cultivars to low-fertile soils with severe P limitation. The online version of this article ( https://doi.org/10.1007/s11104-018-3663-0) contains supplementary material, which is available to authorized users. Authors appreciate the financial support from the National Science Foundation, Sri Lanka through the grant NSF/AG/14/01, technical assistance provided by G Wijesuriya, WMN Wanninayake and S Mayamulla, and anonymous reviewers for the comments to improve an earlier version of the manuscript.